So what’s “Partial” alarm for the Iris system? When I first setup the Iris system the first question I asked myself was what’s “Partial” alarm? I only thought that people would just turn on their security system when they leave the house. After looking at the configurations and hearing stories about break-ins during the night. I can understand why you would like to have a night time setting or if your home alone. Besides the Lowe’s Iris system, I also have the vuezone system from Netgear as my primary cameras. These are the only cameras that I know of which are truly wireless. No wires for power or connection to the hub. All the wireless cameras I’ve seen still require a line for power. How to disconnect the siren from Iris? This is how you disconnect your siren through the Iris web portal. 1) Click on the section for “devices”. How to test your siren? This is how you may test your siren through the Iris web portal. 1) Click on the the section for “devices”. Once you paired your siren to Iris, you may notice that the siren doesn’t trigger correctly. There’s a good chance you need to just enable this option. I’ve created the video below which will show you how. The image above is the reference information to the inside of Everspring siren and I’ve highlighted and pointed to the section regarding the bottom jumper which controls the option listed in the reference for tamper. The image above is the reference information to the inside of Everspring siren and I’m pointing to the section regarding the top jumper which controls the option listed in the reference for audio. So all it means is if the jumper is on the two pins that are covered then the audio is set to High (100db). If the jumper is taken off then it’s set to low (90db). Yesterday we were going through our routine of having breakfast in the morning, and received a call from our next door neighbor to see if our garage door was open. I looked out the window and it was closed, so I asked why you asked? It seems the neighbor next to theirs was open but their own wasn’t touched. Not thinking much of this because it possible maybe they just forgot to close it. So I told her I’ll check out my outdoor cameras and see if it caught anything. To my surprise I see the following at 4:07am in the morning taken by my vuezone cameras! After my failed attempt to find official supported Siren from Iris, I decided to find an alternative. 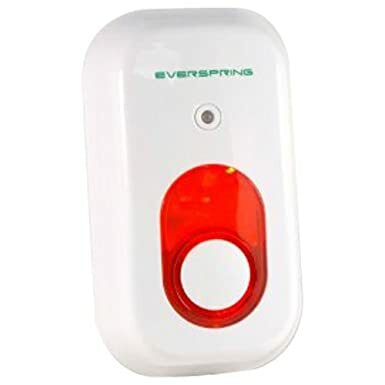 I ran some Google searches for “z wave siren” which lead me to an image that looks exactly like the one Lowe’s offered but it had a different brand. It’s called Everspring model SE812-2. Once I figured out the brand and model it was easier to search for it. As you can see from below the image from Amazon and the screen shot taken from the Lowe’s Youtube video. It looks identical.